The first new generation Embraer E190-E2 for Air Astana arrived at Nursultan Nazarbayev International Airport in Astana today, following ferry flights from the manufacturer’s factory in São José dos Campos, Brazil. This is the first of five Embraer E2 aircraft scheduled to be delivered to Air Astana, following an order originally placed in August, 2017. Air Astana currently operates a fleet of nine Embraer E190 aircraft on domestic and low-density regional services, with the first aircraft having entered service in 2011. The new generation Embraer E190-E2 aircraft will gradually replace older Embraer E190s in its fleet. Air Astana’s first new generation Embraer E190-E2 features Snow Leopard livery. 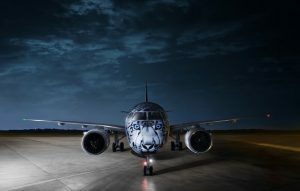 The new aircraft features a special Air Astana “Snow Leopard” livery, which is intended to draw global attention to the threat of extinction faced by this beautiful large wild cat, which is a native of the mountain ranges in southern Kazakhstan. Air Astana seeks to improve ecological protection for endangered species, like the Snow Leopard, as well as more widely preserving the environment. The twin engine, single aisle Embraer E190-E2 belongs to the family of upgraded E-Jets, which offer lower operating costs, emissions and noise levels, with a range of more than 5,000 km.